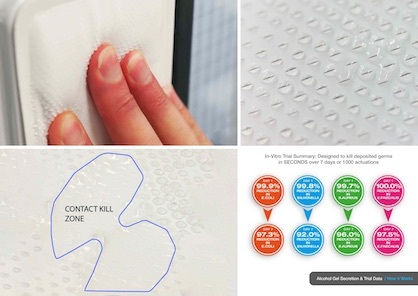 Surfaceskins are ideal for hospitals, SCBU’s, HDU’s, ICU, elderly wards, food preparation, washroom, toilet, factory, schools, offices and other high risk traffic areas, across multiple sectors. 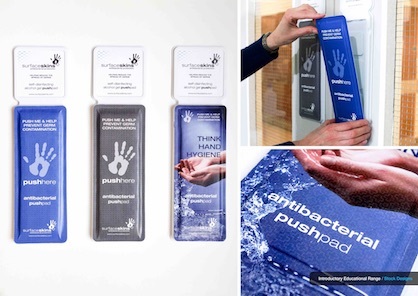 Launched in 2018, the range comprises: an introductory educational range; new custom Surfaceskins providing a high-visibility communication platform to deliver key messages, branding or third party advertising; and, new for 2019, Surfaceskins have developed a round pullhandle, using the same self-disinfecting technology as the pushpads. Globally-patented, the technology behind Surfaceskins has won a raft of awards since launching including: Medilink Innovation in Healthcare Award; Shell LiveWIRE Grand Ideas Award; Venturefest Innovation Showcase Award; Innovation of the Year (Yorkshire Post Excellence in Business Awards), and was a finalist at The Spectator Disruptor of the Year Awards. This latest nomination, for the IDEA19 Achievement Award, was announced on 1st February and winners will be revealed on 27th March. Presented by INDA, the Association of the Nonwoven Fabrics Industry, in partnership with Nonwovens Industry Magazine, the IDEA Achievement Awards occur every three years in conjunction with IDEA – The World’s Preeminent Event for Nonwovens & Engineered Fabrics. The 2019 event marks the ninth anniversary of IDEA as a triennial event and the 50th anniversary of the founding of INDA. Voting for the Achievement Awards opens on 15th February via the Nonwovens Industry website.